Opened as the Midland Electric Theatre on 27th July 1910 with a programme of shorts: “Farmyard Friends”, “Soap in His Eyes”, “Cupid in a Motorboat”, and a colour documentary “North German Lloyds Steamboats”. It was located at the lower end of Babington Lane, diagnally across the road from the Grand Theatre. Designed as Derby’s first purpose built cinema by architect Arthur Eastham, it was styled in a Tudor baronial style, with a foyer that had wood panelling and a fireplace that was lit in autumn and winter months. Seating in the auditorium was on two levels;stalls and a small balcony and the decoration was a barrel vaulted ceiling and panelled walls. In 1914 it was re-named Picture House and around 1920 four murals depicting Grecian scenes were placed on the auditorium walls. Until 1935, the Picture House was the main release cinema in Derby for films from the M.G.M. studio. When larger and more opulent circuit houses were built in the city centre the Picture House held its own playing second run films. In 1957 it was taken over by new owners and given a face lift. The frontage was modernised and the auditorium re-decorated. It still retained its oak panelled foyer and cafe area. It was re-named the Ritz Cinema and had a surprise booking of first run in Derby of the M.G.M. musical “Gigi”, starring Leslie Caron. It changed policy and became the Ritz Continental, screening foreign language films (today called Art House films). It closed on 27th August 1960 with Bourvil in “La Jument verte” (The Green Mare’s Nest). The Ritz was soon demolished and a supermarket was built on the site, now in use as Walmsley’s Suite Superstore selling furniture. A plaque to commemorate The 100 years of cinema and The cinema it self was taken down while the current building is refurbished has been stolen. 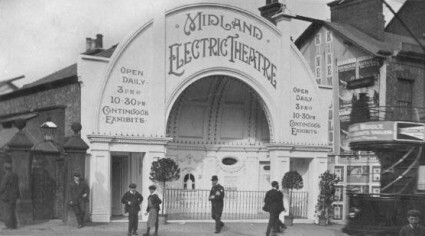 Another old photo of the theatre as the Midland Electric can be seen here.